Hello, this is Taiki from developer productivity team. For this time, I would like to introduce about the knowledge obtained by building and using a service mesh at Cookpad. As for the first one, there was a problem that it became difficult to grasp as to which service and which service was communicating, where the failure of a certain service propagated, as the scale expanded. I think that this problem should be solved by centrally managing information on where and where they are connected. For the second one, we further digged the first one, which was a problem that we do not know the status of communication between one service and another service easily. For example, RPS, response time, number of success / failure status, timeout, status of circuit breaker, etc. In the case where two or more services refer to a certain backend service, resolution of metrics from the proxy or load balancer of the backend service was insufficient because they were not tagged by request origin services. For the third one, it was an issue that "fault isolation configuration has not been successfully set". At that time, using the library in each application, setting of timeout, retry, circuit breaker were done. But to know what kind of setting, it is necessary to see application code separately. There is no listing and situation grasp and it was difficult to improve those settings continuously. Also, because the settings related to Fault Isolation should be improved continuously, it was better to be testable, and we wanted such a platform. In order to solve more advanced problems, we also construct functions such as gRPC infrastructure construction, delegation of processing around distribution tracing, diversification of deployment method by traffic control, authentication authorization gateway, etc. in scope. This area will be discussed later. 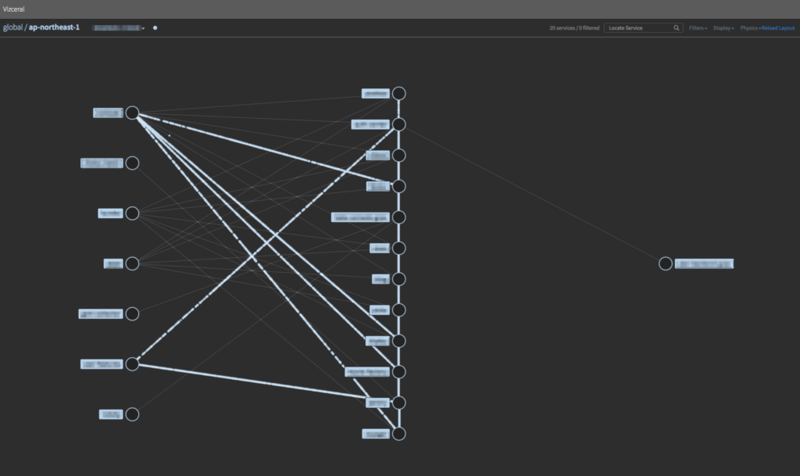 The service mesh in the Cookpad uses Envoy as the data-plane and created our own control-plane. Although we initially considered installing Istio which is already implemented as a service mesh, nearly all applications in the Cookpad are operating on a container management service called AWS ECS, so the merit of cooperation with Kubernetes is limited. In consideration of what we wanted to realize and the complexity of Istio's software itself, we chose the path of our own control-plane which can be started small. A repository that centrally manages the configuration of the service mesh. 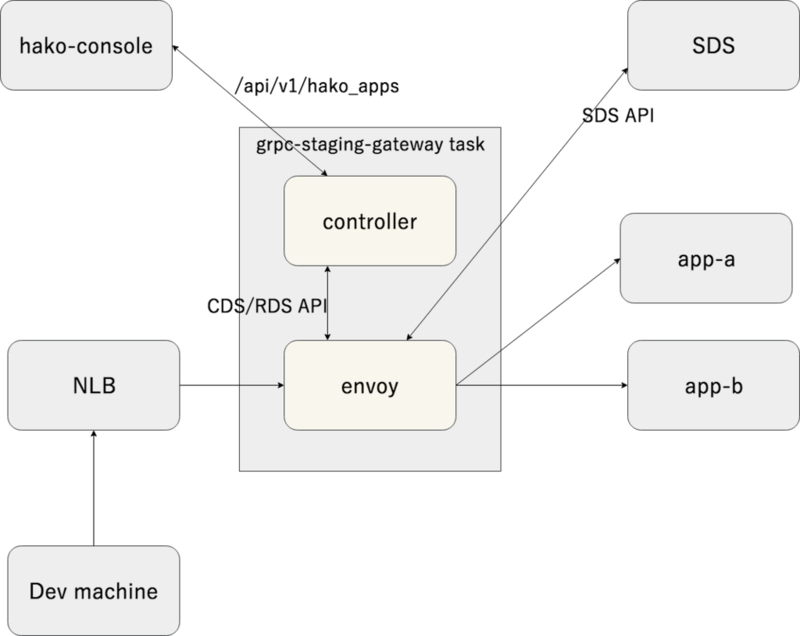 Regarding load balancing, initally, I designed it by Internal ELB, but the infrastructure for gRPC application went also in the the requirement *3, we've prepared client-side load balancing by using SDS (Service Discovery Service) API *4. 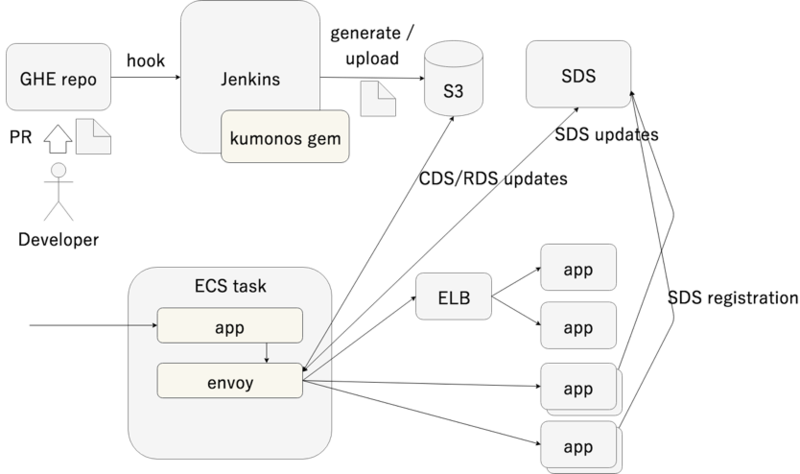 We are deploying a side-car container in the ECS task that performs health check for app container and registers connection destination information in SDS API. 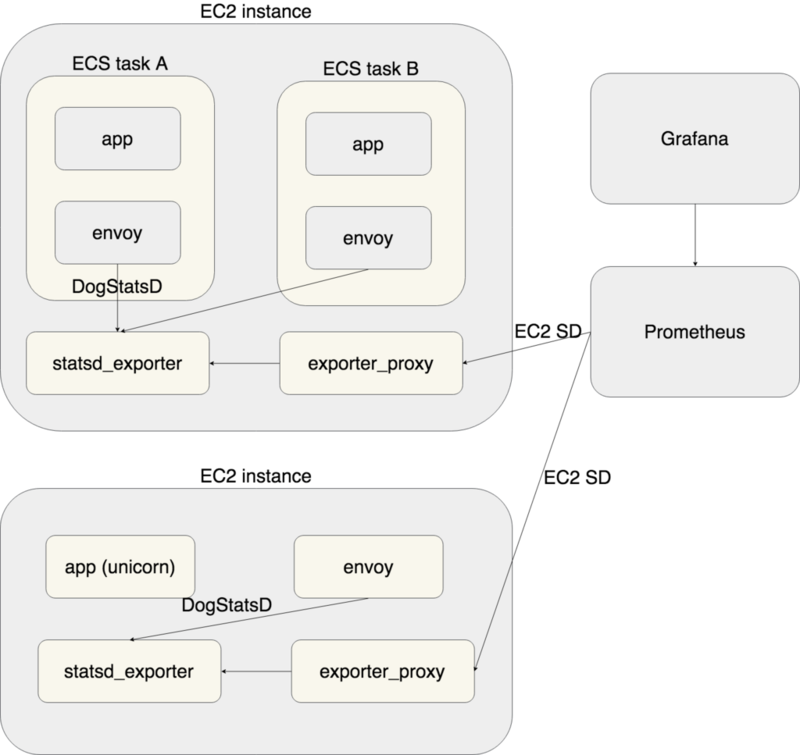 In case the application process runs directly on the EC2 instance without using ECS or Docker, the Envoy process is running as a daemon directly in the instance, but the architecture is almost the same. 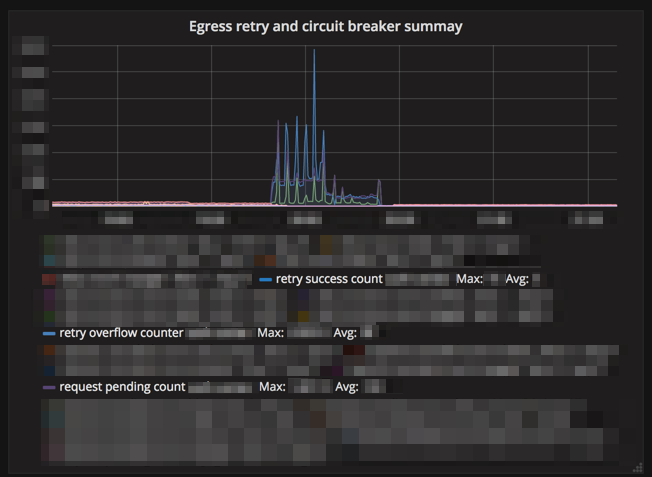 There is a reason for not setting pull directly from Prometheus to Envoy, because we still can not extract histogram metrics from Envoy's Prometheus compatible endpoint*7. As this will be improved in the future, we plan to eliminate stasd_exporter at that time. 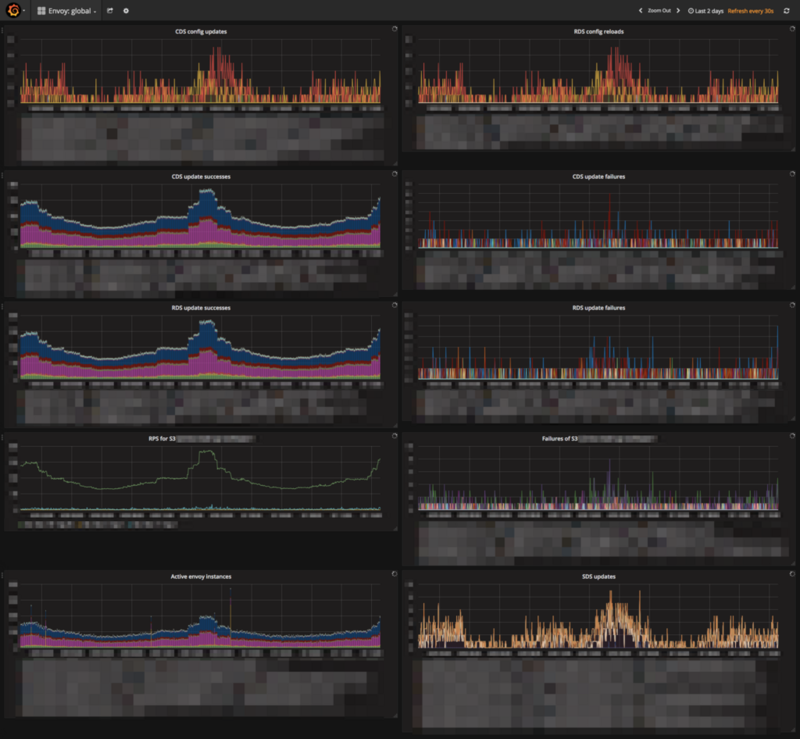 On Grafana, dashboards and Envoy's entire dashboard are prepared for each service, such as upstream RPS and timeout occurrence. We will also prepare a dashboard of the service x service dimension. 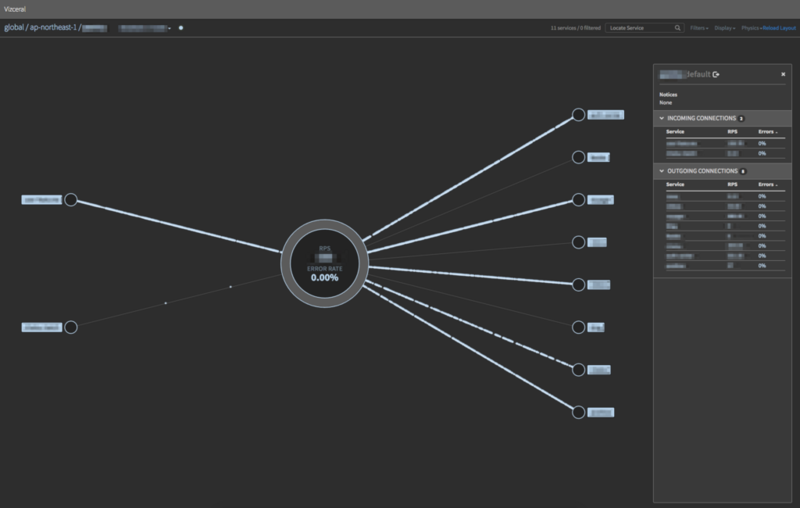 The service configuration is visualized using Vizceral developed by Netflix. For implementation, we developed fork of promviz and promviz-front*8. 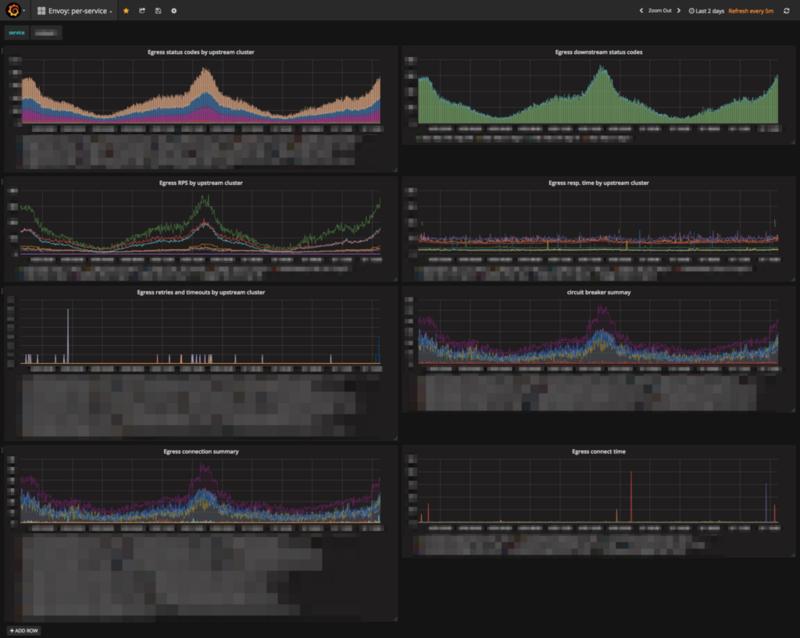 As we are introducing it only for some services yet, the number of nodes currently displayed is small, but we provide the following dashboards. As a subsystem of the service mesh, we deploy a gateway for accessing the gRPC server application in the staging environment from the developer machine in our offices*9. It is constructed by combining SDS API and Envoy with software that manages internal application called hako-console. The most remarkable in the introduction of service mesh was that it was able to suppress the influence of temporary disability. There are multiple cooperation parts between services with many traffic, and up to now, 200+ network-related trivial errors*10 have been constantly occurring in an hour*11, it decreased to about whether it could come out in one week or not with the proper retry setting by the service mesh. Various metrics have come to be seen from the viewpoint of monitoring, but since we are introducing it only for some services and we have not reached full-scale utilization due to the introduction day, we expect to use it in the future. In terms of management, it became very easy to understand our system when the connection between services became visible, so we would like to prevent overlooking and missing consideration by introducing it to all services. The xDS API has been using v1 because of its initial design situation and the requirement to use S3 as a delivery back end, but since the v1 API is deprecated, we plan to move this to v2. At the same time we are considering moving control-plane to Istio. Also, if we are going to make our own control-plane, we plane to build LDS/RDS/CDS/EDS API*12 using go-control-plane. Up to now, Cookpad uses NGINX as reverse proxy, but considering replacing reverse proxy and edge proxy from NGINX to Envoy considering the difference in knowledge of internal implementation, gRPC correspondence, and acquisition metrics. As we move to client-side load balancing and replace reverse proxy, we will be able to freely change traffic by operating Envoy, so we will be able to realize canary deployment, traffic shifting and request shadowing. It is a mechanism that deliberately injects delays and failures in a properly managed environment and tests whether the actual service group works properly. Envoy has various functions *13. In Cookpad, AWS X-Ray is used as a distributed tracing system*14. Currently we implement the distributed tracing function as a library, but we are planning to move this to data-plane and realize it at the service mesh layer. This is to authenticate and authorize processing only at the front-most server receiving user's request, and the subsequent servers will use the results around. Previously, it was incompletely implemented as a library, but by shifting to data-plane, we can recieve the advantages of out of process model. We have introduced the current state and future plan of service mesh in Cookpad. Many functions can be easily realized already, and as more things can be done by the layer of service mesh in the future, it is highly recommended for every microservices system. *9:Assuming access using client-side load balancing, we need a component to solve it. *10:It's very small number comparing to the traffic. *11:Retry is set up in some partes though.